During the summer, the Main Stand is refurbished to create a new sportsman's bar, and banqueting/ conferencing facilities (Photos taken during building work). 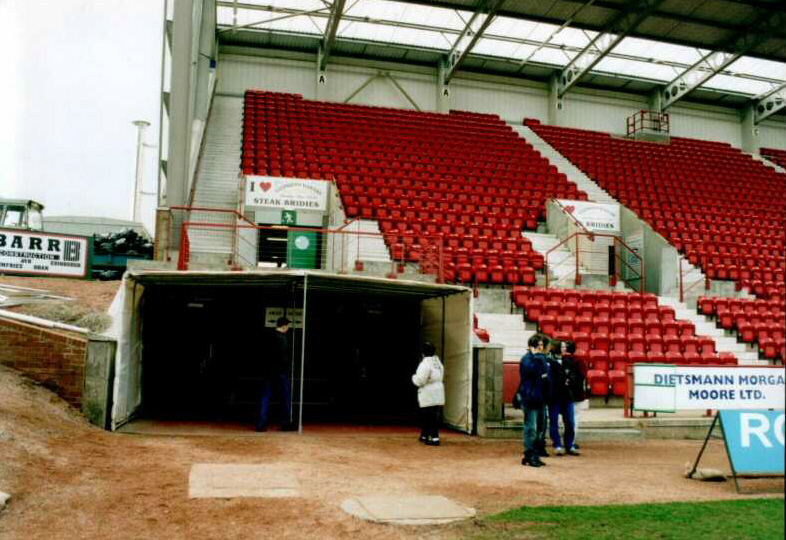 East End Park pictured during the Open Day 5th May '02, one week before refurbishment of the Main Stand commenced. The Boardroom (right) will be replaced during the work. Under soil heating is installed to protect the pitch from freezing during the winter months. A glamour friendly against Arsenal marks the completion of the redeveloped EEP. The star studded London club prove too strong for the Pars and run out 3-0 winners. The West stand is renamed 'The Norrie McCathie" Stand. Prior to the SPL match against Motherwell, Norrie's mother and brothers take part in the official opening ceremony. Dunfermline 2 Dundee 0 - first game at an all seated EEP. Whilst construction work continues, home fans are housed temporarily in the East Stand for the first three games of the season. Dunfermline 1 Celtic 1 - last match played at EEP in front of terracing. New continental style floodlights and pylons are installed. Their first action comes on 1st November 1997, against Celtic, when the Pars were beaten 0-2. East End Park boasts two sets of floodlights for the remainder for the season. 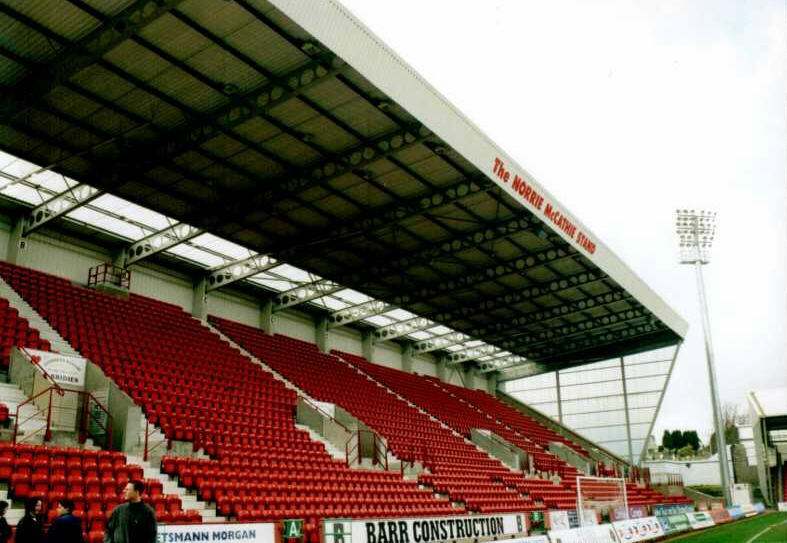 EEP during the summer of '97 during the replacement of the North Terracing and the recladding of the Main Stand. The north terracing removed and replaced with seating. The main stand is reclad, refurbished, and a new entrance porch built. Weights and gym rooms have also been added inside the stand. TV camera position moved from back of the Main Stand to specially built gantry above the North Terracing. East Terracing (away end) completely reconstructed, with new entrance turnstiles and exits installed. Hopes that the ground's capacity would be raised to 23,090, came to nothing as the limit was set at 19,900. The East enclosure becomes all seater with room for 585 spectators. New turnstiles installed at the entrance to the west terracing (home end), as well as new seating in the Main Stand. A crowd of 27,816 sets the never to be beaten, highest ever attendance at EEP for the visit of Celtic. League champions Celtic beat the Scottish Cup holders Dunfermline 2-1, in a game that saw chaotic crowd scenes, during which one man lost his life. North terracing roofing is extended, to be joined later by the roofing covering the west terracing. Three quarters of the ground is now under cover. Dunfermline 2 Kilmarnock 0 (Division One) - last game played in front of old stand. The stand was demolished the following week, to make way for the construction of a new main stand costing �65,000. A friendly against Sheffield United is the first game to be played under the new floodlights at EEP. United win 4-3. The lights, costing �12,000, are officially switched on by Provost Frederick. Pitched roof installed over north terracing. The first crush barriers are installed. Dunfermline 5 East Stirling 2 is the first match broadcast from East End Park on the radio. Three huts purchased for use as a small enclosure on the north terracing. North terracing roofed, and east terracing upgraded using timber from the Mauretania. A liner being broken up at Rosyth. Greyhound racing introduced at EEP in a bid to raise income. The dogs continued off and on until 1951. East End Park is shut for a month after a referee was jostled and barracked after a match against St Johnstone. 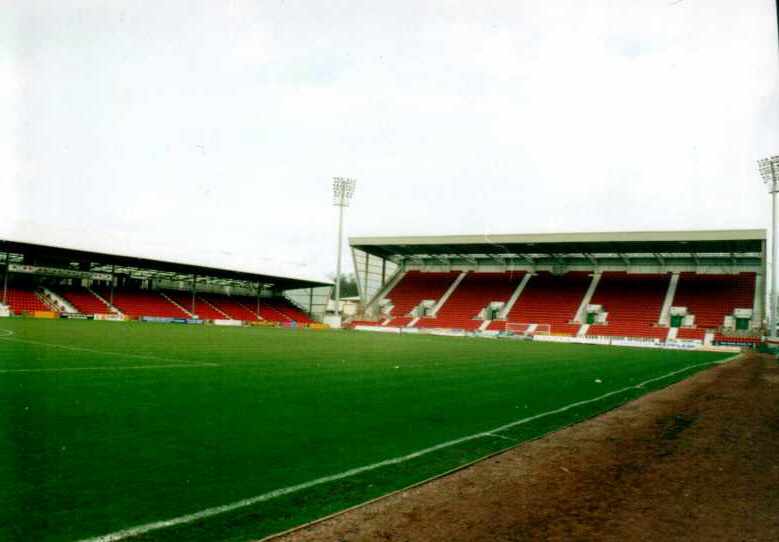 East End Park moves to its current location after the Board of Directors buy three acres of land to the east of the original ground. The land cost �3,500 and the pitch was surrounded by a cinder track, with embankments, on the north, east and west sides. The plans optimistically suggested that the ground could hold 64,000 spectators. A new pavilion is formally opened by Provost Donald. The building measuring, 30ft x 12ftx8ft, cost �80 to construct and consisted, two changing rooms, a bathroom and a meeting room. The first game played at the original East End Park, after the ground is secured by lease from the North British Railway Company. The match, a friendly versus Edinburgh University, ended in a 2-1 win for the Pars. The original EEP was slightly to the west of the existing location surrounded by the cemetery, gaol, poorhouse, hospital and railway line.